Aquaporin-1 (AQP1) channels are constitutively active water channels that allow rapid transmembrane osmotic water flux, and also serve as cyclic-GMP-gated ion channels. Tetraethylammonium chloride (TEA; 0.05 to 10 mM) was shown previously to inhibit the osmotic water permeability of human AQP1 channels expressed in Xenopus oocytes. The purpose of the present study was to determine if TEA blocks osmotic water flux of native AQP1 channels in kidney, and recombinant AQP1 channels expressed in a kidney derived MDCK cell line. We also demonstrate that TEA does not inhibit the cGMP-dependent ionic conductance of AQP1 expressed in oocytes, supporting the idea that water and ion fluxes involve pharmacologically distinct pathways in the AQP1 tetrameric complex. TEA blocked water permeability of AQP1 channels in kidney and kidney-derived cells, demonstrating this effect is not limited to the oocyte expression system. Equivalent inhibition is seen in MDCK cells with viral-mediated AQP1 expression, and in rat renal descending thin limbs of Henle's loops which abundantly express native AQP1, but not in ascending thin limbs which do not express AQP1. External TEA (10 mM) does not block the cGMP-dependent AQP1 ionic conductance, measured by two-electrode voltage clamp after pre-incubation of oocytes in 8Br-cGMP (10–50 mM) or during application of the nitric oxide donor, sodium nitroprusside (2–4 mM). TEA selectively inhibits osmotic water permeability through native and heterologously expressed AQP1 channels. The pathways for water and ions in AQP1 differ in pharmacological sensitivity to TEA, and are consistent with the idea of independent solute pathways within the channel structure. The results confirm the usefulness of TEA as a pharmacological tool for the analysis of AQP1 function. Tetraethylammonium is known as a pore-occluding blocker of voltage-gated potassium channels , but it also blocks other cationic channels such as calcium-dependent K+ channels [2, 3] and the nicotinic acetylcholine receptor . TEA at 0.1 to 10 mM also inhibits osmotic water flux through human AQP1 channels expressed in Xenopus oocytes, decreasing the net swelling rate in hypotonic saline by 30–40% as compared to AQP1-expressing oocytes not treated with TEA . 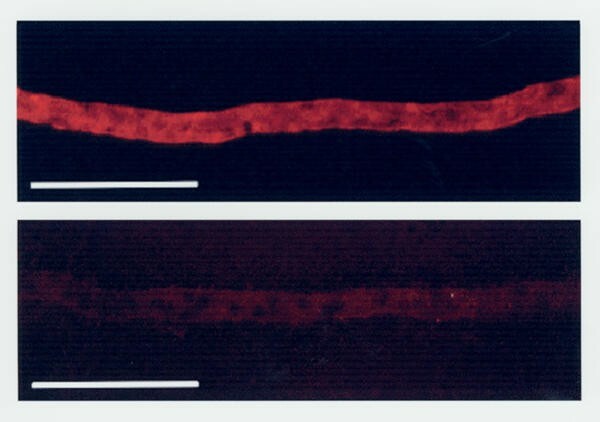 This blocking effect on osmotic water flux was demonstrated to involve AQP1 channels specifically by using site-directed mutagenesis (tyrosine 186 to phenylalanine) to generate a Y186F AQP1 channel that is insensitive to block by TEA, but retains sensitivity to block by mercury. The blocking effect of mercury in AQP1 channels is dependent on a neighboring residue, cysteine 189 . TEA offers attractive advantages over mercury as a reversible and less toxic blocker for AQP1 channels in experimental analyses of water channel function; however, the relevance of TEA as a blocker for AQP1 channels outside the Xenopus expression system has not been examined previously. Differences in properties (including pharmacological sensitivities) have been observed for ion channels expressed in oocytes as compared to those in native tissues. For example, the Torpedo acetylcholine receptor and the Shaker K+ channel protein differ in the fractions of protein glycosylated, the composition of the oligosaccharide chains, and the degree of protein maturation when expressed in Xenopus oocytes as compared with channels in native tissue or other expression systems [7, 8]. Differences in glycosylation patterns can influence the binding of external blocking agents. The presence of tissue-specific targeting signals not recognized in Xenopus oocytes may lead to protein degradation . These discrepancies raised the question of whether AQP1 channels in native tissues are sensitive to TEA, as they are in Xenopus oocytes. Data presented here show that TEA is effective as a blocker of AQP1 channels expressed in a mammalian renal cell line and in native renal epithelial membrane. AQP1 channels are complex solute conductors. They are constitutively permeable to water, and also function as regulated non-selective cation channels  when gated by intracellular cyclic GMP [11, 12]. Even though only a small proportion of the AQP1 channels that are present in the membrane appear to be available for cGMP-activation of the ionic conductance (1/56,000), model-based calculations nonetheless suggest that this contribution could be meaningful in a physiological setting . Unlike transporters which move substantial amounts of substrate by design, ion channels function to change membrane potential by the net movement of relatively tiny amounts of charge (~10 picomoles per cm2 membrane to generate a change of 100 mV) , hence the low proportion of active AQP1 ion channels is consistent with a functional goal of gated ionic signaling that is distinct from that of massive constitutive osmotic water permeability. The role of the AQP1 channel in mediating both water and ion fluxes raises interesting questions about whether the pathways are shared or structurally distinct. Expression of AQP1 channels in bilayers has shown that the water permeability but not the ionic conductance is blocked by p-chloromethylbenzenesulfonate, indicating that the two fluxes may involve distinct pathways . Work presented here provides an additional line of evidence that the pathways for water and ions in AQP1 can be distinguished pharmacologically, using the blocker TEA as a probe. In combination with data from three-dimensional imaging analyses , these results support the suggestion that the AQP1 channel may contain separate parallel pathways for ion and water fluxes. These findings have potential significance in understanding the complex role for AQP1 in processes of salt and water movement across cell membranes. TEA inhibited significantly the osmotically-driven net movement of water across monolayers of Madin-Darby Canine Kidney (MDCK) cells expressing human AQP1, as compared to AQP1-infected MDCK cells without TEA treatment (Figure 1). MDCK cells were induced to express AQP1 by infection with replication-deficient adenovirus (see Materials and Methods). These cells showed a high rate of water flux, ranging from 4 to 10 μl/cm2/hour, and a significant block by 1 mM TEA, ranging from 32 to 45% in 6 sets of replicate experiments. The TEA block of AQP1-mediated water flux for all data combined was 34.2%. In control MDCK cells infected with empty virus, the water flux was significantly lower (approximately 10-fold), ranging from 0.2 to 1.4 μl/cm2/hour. In these control cells, the net flux rates with and without treatment were not significantly different. Therefore, the enhanced water permeability and concomitant sensitivity to block by TEA were dependent on the expression of AQP1 channels. MDCK cells transfected with empty virus showed no augmentation of transepithelial water movement, confirming previous work that showed water does not flow across tight junctions in MDCK confluent layers . Cells transfected with empty virus also showed no effect of TEA treatment. The magnitude of block of AQP1-mediated water permeability by TEA is consistent with that reported previously for AQP1 channels expressed in Xenopus oocytes . Block by TEA of AQP1-mediated water permeability in monolayers of adenovirus-infected MDCK cells. (A) To account for differences in levels of AQP1 expression between different experimental preparations, data for "Percent water flux" were standardized to the mean water flux measured for AQP1-expressing monolayers without TEA on the same experimental day. Cells infected with empty adenovirus were untreated (Control) or treated with TEA (Con TEA). Cells infected with AQP1 adenovirus and expressing AQP1 were untreated (AQP) or treated with TEA (AQP TEA). Box plots show the distribution of data values; the gray box encloses 50% of the data points, the error bars show the full range, and the horizontal bar shows the modal value. Data for mean, standard error and n value are shown below each column. Significant differences were analyzed by T-test and are reported as p < 0.001 (*), and not significant (N.S. ; p < 0.50) (B). Whole cells lysates were prepared from MDCK cells on filters and 10 μg of protein was loaded onto each lane. Shown is the expression of AQP1 protein in MDCK cells infected with empty (CON) or AQP1 adenovirus. No AQP1 protein was seen in CON lanes even after extended exposures to film (i.e., 30 minutes). Preparations of pure descending thin limbs and pure ascending thin limbs from the inner medulla were segregated by morphological features. Descending thin limbs with their cells with nuclei protruding into the lumen differ markedly in appearance from ascending thin limbs with their large, round, flat nuclei when viewed with DIC optics [17, 18]. The differential expression of AQP1 in the two different types of segments (abundant in the descending thin limb and absent in the ascending thin limb), visualized by immunocytochemistry, confirmed the accuracy of the morphological identification (Figure 2). AQP1 provides the predominant pathway for water transport in the descending thin limb [19, 20]. 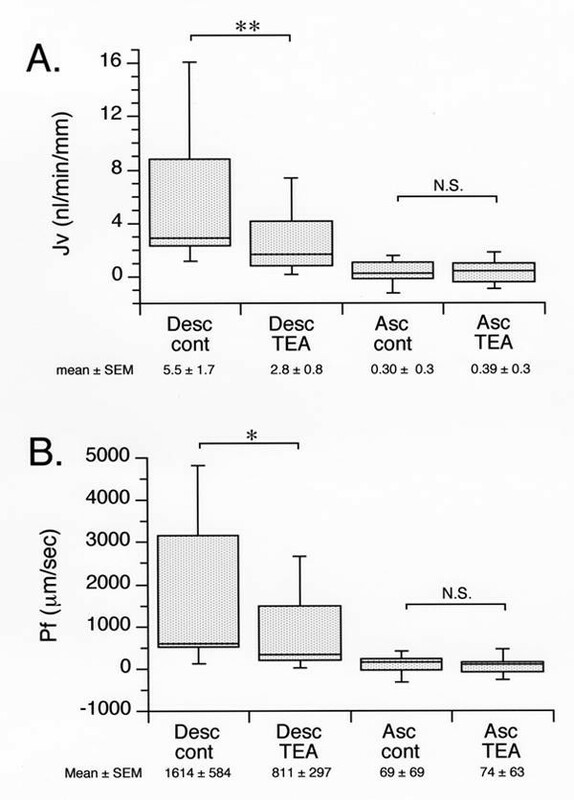 In preparations of isolated perfused descending thin limbs, net osmotic water absorption rates (Jv) and water permeability (Pf) were significantly lower in the presence of 10 mM TEA than in the absence of TEA (Figure 3). This sensitivity to TEA correlates with the expression of AQP1 channels in this region. The overall effect of TEA in descending thin limb was to cause a 49% block of JV and a 50% block of Pf. The pairwise comparison of individual tubule preparations, before and after TEA, showed a significant percent change of (-) 52 ± 6 % (mean ± SEM; n = 10) in descending thin limb. In contrast, preparations of ascending thin limbs that lack AQP1 channels showed essentially no net water flux and no effect of TEA under osmotic gradient conditions. For data from ascending thin limbs, the pairwise comparison of individual tubule preparations before and after TEA showed a non-significant percent change of (+) 17 ± 35 % (n = 9). 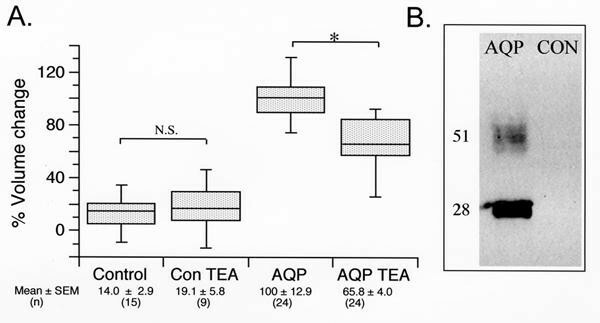 These data show that the blocking effect of TEA on water permeability originally observed in AQP1-expressing oocytes can be reproduced in a physiologically relevant condition. TEA blocks water permeability in a tissue that has abundant native expression of AQP1 channels, whereas it has no effect in tissue lacking AQP1 expression. Immunocytochemical analysis confirms the expression of AQP1 channels in pure descending but not ascending thin limb preparations. Examples are shown for isolated preparations of rat inner medullary descending thin limb(upper panel) and inner medullary ascending thin limb (lower panel) labeled with a rabbit antibody to the AQP1 carboxy tail domain, and visualized with Cy5-labeled antirabbit antibody immunoglobulin-G. The scale bar is 100 μm. Analysis of water flux in isolated perfused renal ascending and descending thin limbs of Henle's loop under osmotic gradient conditions.A. Compilation of Jv values obtained for descending thin limbs that were untreated (Desc cont) or exposed to 10 mM TEA (Desc TEA), and for ascending thin limbs that were untreated (Asc cont) or exposed to TEA (Asc TEA). B. Compilation of calculated osmotic water permeabilities (Pf) for the same tubules as analyzed in (A). Box plots show the distribution of data values; the gray box encloses 50% of the data points, the error bars show the full range, and the horizontal bar shows the modal value. Data for group means, standard errors and n values are shown below each column. However, since each tubule served as its own control, differences were analyzed by paired T-test and are reported as p < 0.02 (**), p < 0.05 (*), and not significant (N.S.). Heterologous expression of human AQP1 in Xenopus oocytes, a system that has been well characterized for electrophysiological assays, was used for two-electrode voltage clamp studies to evaluate the effects of TEA on ionic currents. External TEA(10 mM) failed to block the cGMP-dependent ionic current in AQP1-expressing oocytes (Figure 4). Current responses were assessed with voltage steps from +40 to -70 mV, from a holding potential of 0 mV (Fig. 4A). The initial response shows the current-voltage relationship recorded by two-electrode voltage clamp in an AQP1-expressing oocyte in isotonic 100 mM Na+ saline (see Methods). The activated response was measured in the same oocyte at 3–5 minutes after addition of 4 mM sodium nitroprusside (SNP), which elevates endogenous cGMP levels. The effect of 10 mM TEA (with 90 mM NaCl) was assessed by perfusing the recording chamber with TEA saline containing SNP. No appreciable change was observed. For the representative example shown in Figure 4, the conductance (measured as the linear slope of the current-voltage relationship between -50 and +30 mV; Fig. 4B) for the initial condition was 3.0 nA/mV. After channel activation the conductance was 58 nA/mV in Na+ saline and 57 nA/mV in 10 mM TEA saline. The reversal potential of the current (Fig. 4B) shifted from approximately -24 mV in the initial state to about -4 mV in the activated state, consistent with the activation of a non-selective cationic conductance permeable to both Na+ and K+. Similar results were observed for other SNP-activated oocytes (n = 5), as well as for AQP1-expressing oocytes activated by prior incubation in 10 mM 8Br-cGMP (as described in ). In AQP1-expressing oocytes, the conductance induced by 8Br-cGMP in control Na+ saline did not change significantly [(+) 11.6 ± 6.2 % (mean ± SD; n = 7)] after perfusion with 10 mM TEA saline, thus confirming the absence of a blocking effect of TEA on the ion conductance by AQP1 channels. 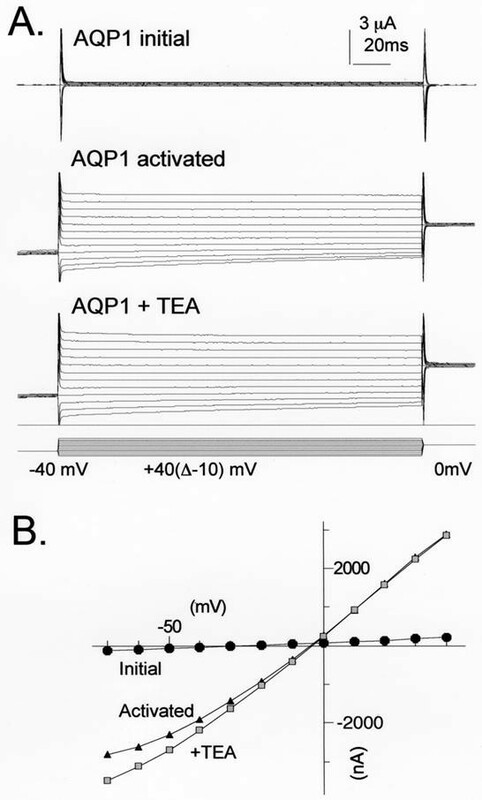 The activated AQP1 ion channel is less permeant to TEA than to Na+ or K+; however, because of the high extracellular Na+ concentration (90 mM) in the TEA bath saline in the present study, the measured reversal potential of the activated current was not appreciably different with and without 10 mM TEA. Tetraethylammonium does not block the ionic conductance in cGMP-activated AQP1 channels expressed in Xenopus oocytes.A. Recordings of current responses to voltage steps analyzed by two-electrode voltage clamp in an AQP1-expressing oocyte before stimulation (initial), after cGMP-dependent activation in 100 mM Na+ saline (activated) and after perfusion with saline containing 10 mM TEA and 90 mM Na+ (+TEA). No block of the ionic current was observed. B. Plot of the current-voltage relationship for data illustrated in (A). Conductance values calculated from linear fits of the data from -50 to +30 mV were 3.0 μS initial, 57.8 μS after activation in Na+ saline, and 57.3 μS with 10 mM TEA. Results presented here show that TEA serves as an effective, though partial, blocker of the osmotic water permeability mediated by human AQP1 channels expressed in a heterologous mammalian cell line and by native AQP1 channels in isolated rat renal descending thin limbs of Henle's loops. Before the characterization of TEA, mercurial compounds were among the only known blockers of AQP1, affecting both the constitutive water flux and the regulated ion conductance [6, 10]. For AQP1 channels expressed in Xenopus oocytes, the block of osmotic water flux is 5% in 0.01 mM TEA, 21% in 1 mM TEA, and 36% in 10 mM TEA, as referenced to the osmotic water flux in control AQP1-expressing oocytes . Data presented here show that the level of block by TEA is comparable or greater for AQP1 channels expressed in mammalian cells. 1 mM TEA produces a 34% block of osmotic water flux in MDCK cells, and 10 mM TEA produces a 50% block in renal descending thin limbs. The effect of TEA on water permeability in cells and tissues that express high levels of AQP1 channels is likely to be significant, given the substantial amount of water that can be moved across AQP1-expressing epithelia (for example, see data on descending thin limbs in Fig. 3). The idea that TEA might be a candidate for a lead compound for the development of drugs with possible clinical applications  is supported by the present data that show the effectiveness of TEA in two different mammalian models of AQP1-mediated osmotic water permeability. While the usefulness of TEA in vivo as a research tool may be limited by toxicity and effects on other channels at higher concentrations, it offers a degree of reversibility and selectivity not seen with mercury, an agent which acts by covalent modification of all exposed cysteine residues [21, 22]. The regulated ion channel function of AQP1 is not blocked by external TEA. An intriguing question remains regarding the location of the permeation pathway for cations in AQP1 channels. Analysis of the crystal structure of GlpF suggests that potential ion binding sites may be located in the central pore, at the four-fold axis of symmetry in the tetrameric association of subunits that form the channel . Interestingly, this arrangement of a tetramer of subunits to form a central ion pore is a hallmark of the family of voltage-gated ion channels , which rely on a tetrameric organization to create a central pore for ions that is lined by sequences contributed from all four subunits. In contrast, the four individual pores for water or glycerol, located within each subunit of AQP1 or GlpF, appear to be lined with hydrophobic residues expected to preclude ion permeability [15, 24, 25]. Importantly, TEA distinguishes between the two pathways in AQP1, supporting the idea that the ion and water pores are physically distinct although they co-exist in the same channel complex. The AQP1-mediated ion conductance may contribute measurably to the function of tissues in which AQP1 is abundantly expressed, such as in the mammalian renal proximal tubule . Further work is needed to assess the additional levels of regulatory control that may constrain the availability of the AQP1 proteins to serve as ion channels gated by cGMP, within a background of constitutive water channel activity. The maintenance of an ionic pore, as well as a conserved cGMP-binding domain in the AQP1 carboxy tail for regulating activation , suggests that the ion channel function is likely to be essential for physiological regulatory processes that have yet to be fully appreciated. Madin-Darby Canine Kidney (MDCK) cells were obtained as a gift from Dr. R. Lynch, University of Arizona, and used between passages 13–14. Cells were grown and maintained in Dulbecco's Modified Eagle Medium (Life Technologies) that was supplemented with 10% fetal bovine serum (Hyclone), 170 mM glutamine and penicillin/streptomycin (100 μg/ml, Life Technologies) in humidified air containing 5% carbon dioxide at 37°C. The adenovirus (AV) backbone for the aquaporin-1 (AQP1) sense and antisense AV constructs was a replication-deficient "first-generation" AV with deletions of the E1 and E3 genes . This "empty" AV contains the cytomegalovirus (CMV) promoter and bovine growth hormone polyadenylation (bHG) site separated by a polylinker that was used to clone AQP1 DNA as described previously . A recombinant AQP1 virus was constructed using a plasmid containing the coding sequence for AQP1, pCHIPev . pCHIPev was digested and the AQP1 insert was subcloned into the shuttle vector pSKAC, creating pSKAC/AQP1. pSKAC contains map units 0.0–1.3 of the AV which includes the left terminal repeat of AV, a CMV promoter, an AMV translation enhancer and a polylinker region. DNA fragments containing AQP1 DNA were liberated from pSKAC after restriction and ligated into adenovirus as described previously . Human embryonic kidney cells (293 cells) were transfected with ligation mixture and individual viruses were isolated from cell lysates by two consecutive rounds of plaque purification using an agar overlay as described previously . Individual viruses were amplified in 293 cells and purified over cesium step gradient. Individual AV DNA titers were determined by three different methods: 1) plaque titration on 293 cells, 2) immunofluorescence microscopy of AV protein expression (anti-penton group antigen, clone 143, Biodesign, Kennebunk, ME) in 293 cells infected with serial dilutions of AV and 3) absorbance at 260 nm (pfu/ml = A260 × dilution × 1010). Water permeability was measured as the net fluid movement driven by an osmotic gradient across intact monolayers of adenovirus-infected MDCK cells, by methods similar to those reported previously [27, 29]. Cells were seeded onto Transwell filters (Costar, 1 cm2, 0.4 μm pore size) at a density of 1.5 × 105 cells per well. Cells were maintained in humidified air containing 5% CO2 for two weeks to allow for cell-cell junctions to mature. Cells were infected at the apical surface with adenovirus containing AQP1 cDNA or with empty adenovirus at a multiplicity of infection (MOI) of 10. Five days post-infection, all medium was removed carefully and completely from both upper (apical) and lower (basolateral) chambers. Exactly one milliliter of fresh prewarmed isotonic medium (~300 mOsM) was added to the lower chamber and exactly 175 μl of hypertonic medium (~450 mOsM) was added to the upper chamber at time zero. In experimental groups, TEA chloride was present at a 1 mM concentration in both the upper and lower chambers. After four hours of incubation at 37°C, all of the medium from each of the upper chambers was removed carefully and volume was measured using an analytical balance. Sodium dodecyl sulfate (SDS) solubilized whole cell lysates containing 5% β-mercaptoethanol were electrophoresed into 12% polyacrylamide gels containing 0.1 % SDS. Fractionated proteins were blotted onto nitrocellulose using the Transblot system as per manufacturer instructions (Biorad, Hercules, CA). The blots were preincubated for 30 minutes at 22°C in Tris-buffered saline containing 5% nonfat powdered milk and 0.2% Tween-20 (TBS-T), and were then probed with affinity purified anti-AQP1 IgG (1:5000) for 2 hr at 22°C. The blots were washed (3 × 15 min) in TBS-T and were incubated for 2 hours with horseradish peroxidase-conjugated secondary antibodies (goat anti-rabbit, 1:5000, Pierce). The blots were washed (3 × 15 min) in TBS-T and specific labeling was visualized following enhanced chemiluminescence (Pierce, Rockford, IL) and exposure (10 seconds) to ECL-Hyperfilm (Amersham, Arlington Heights, IL). Immunoblots were digitized using the UVP gel documentation system and densitometry was performed using LabWorks software (Upland, CA). Young male Munich-Wistar rats (Harlan Sprague-Dawley, Indianapolis, In), 90 g average body weight, were maintained on Teklad Mouse/Rat Diet No. 7001 with free access to water. Dissection of inner medullary thin limbs of Henle's loop from fresh rat renal tissue for immunocytochemistry and for in vitro microperfusion was performed as described in detail previously . We used descending thin limb (DTL) and ascending thin limb (ATL) segments from the top 70% of the inner medulla above the pre-bend level. Descending and ascending thin limbs were identified by cell type using an inverted microscope with Nomarski differential interference contrast (DIC) optics at 400× magnification [17, 18]. Rabbit antibody recognizing the carboxy tail domain of AQP1 (from W.D. Stamer and J.W. Regan, University of Arizona) was used for immunocytochemical confirmation of protein expression in isolated thin limbs of Henle as described previously . Tubules were positioned onto a glass microscope slide covered with a layer of Cell-Tak® adhesive (Becton Dickinson, Bedford, MA). Tubules were then fixed in 4% paraformaldehyde for 10 min and permeabilized with 100% methanol for 2 min at -20°C. Primary antibody or non-immune rabbit serum (diluted 1:500) was applied overnight at 4°C., followed by incubation with biotinylated goat anti-rabbit antibody (diluted 1:100, 60 min), and incubation with streptavidin conjugated to Cy5 (60 min). Digital fluorescent images were obtained with a Leica-TCS confocal microscope. The Ringer solution used for perfusing and bathing the tubules was that initially used by Chou and Knepper  in perfusion of thin limbs from chinchilla kidneys and modified by us. It contained (in mM): 130 NaCl, 20 HEPES, 5 NaHCO3, 2.5 K2HPO4, 2 CaCl2, 1.2 MgSO4, 5.5 glucose, and 5 urea. The osmolality was about 290 mOsm/kg H2O, the pH was adjusted to 7.4 while the solution was gassed with 95 O2/5% CO2. We perfused the dissected tubules in vitro by a technique essentially the same as that originally described by Burg et al. and modified for use in our laboratory [17, 32, 33]. The perfusion rate was about 15–20 nl/min. The temperature of the bathing chamber was maintained at 37°C during perfusion and the bath was covered with a layer of light paraffin oil. To check for leaks and to measure net fluid movement across the epithelium with an imposed osmotic gradient, [14C]dextran (MW ~70,000) was added to the perfusate. There is no net transepithelial water movement with solutions of identical osmolalities in the bath and lumen. For this study, however, we determined the occurrence of net water absorption and water permeability when we imposed an osmotic gradient from bath to lumen (see below). Net water absorption, Jv (nl min-1 mm tubule length-1), was determined in each collection period with [14C]dextran in the perfusate using the following relationship: Jv= (Vi - Vo)/L. In this equation, Vi(initial perfusion rate, nl/min) is calculated by dividing the cpm of 14C in the collected fluid by the cpm/nl of 14C in the initial perfusate and by the time of the collection period; Vo (collection rate, nl/min) is measured directly from the collection; and L (mm) is the length of the tubule perfused, measured with an ocular micrometer. For purposes of determining the water permeability of DTL and ATL, we imposed a 100 mOsmol/kg H2O osmotic gradient from bath to lumen with sucrose and determined Jv as just described. Water permeability (Pf, μm s-1) was then determined from the equation Pf = Jv/(As Vw δCosmol) where As = luminal surface area (π DL), Vw = partial molar volume of water (18 ml/M), δCosmol = transepithelial osmolality gradient . When the effect of TEA on water movement was examined, TEA bromide (10 mM) was added to the bathing medium and the NaCl concentration was reduced by 10 mM to maintain the osmolality constant. Collection periods were 5 min in length and each tubule served as its own control for measuring net water flux and water permeability in the presence and absence of TEA. [14C]dextran (sp act 1.08 mCi/g) was obtained from American Radiolabeled Chemicals, St. Louis, MO., USA. Results are summarized as means ± SE. The n value is the number of tubules. Each tubule came from a different animal. Adult female Xenopus laevis were anesthetized with tricaine methane sulfonate (MS-222, Sigma Chemical Co). Stage V-VI oocytes were removed by partial laparotomy and defolliculated by collagenase treatment . Cloned human Aquaporin1 DNA was provided by Dr. P. Agre , linearized with XbaI and used as a template for in vitro synthesis of cRNA with T3 RNA polymerase. Prepared oocytes were injected with 50 nl of sterile water (control oocytes) or 50 nl of sterile water containing AQP1 cRNA (~0.2 to 0.5 ng/nl) and were incubated for 2–5 days at 18°C in culture medium (ND96: 96 mM NaCl, 2 mM KCl, 1.8 mM CaCl2, 1 mM MgCl2, 5 mM Hepes, 2.5 mM pyruvic acid, 100 U/ml penicillin, and 100 μg/ml streptomycin, pH 7.6) to allow protein expression. Two-electrode voltage clamp recordings were performed at room temperature with electrodes (0.5–3 MΩ) filled with 3 M KCl. Data were recorded with a GeneClamp 500 (Axon Instruments, Foster City, CA), filtered at 2 kHz, digitized at 50 to 2000 μs and analyzed with pClamp software (Axon Instruments). Control recording saline for two-electrode voltage clamp contained (in mM): 100 NaCl, 5 MgCl2, and 5 HEPES, pH 7.3. TEA saline was made with (in mM) 10 TEA.Cl, 90 mM NaCl, 5 MgCl2, and 5 HEPES, pH 7.3. Activation of the ionic current was induced by preincubation of AQP1-expressing oocytes for 10–30 minutes in 10 mM 8Br-cGMP (Sigma) in high K+ saline, containing (in mM): 30 KCl, 80 K gluconate, 5 MgCl2, 5 HEPES, pH 7.3, or by addition of 2–4 mM sodium nitroprusside (SNP), a stimulator of guanylate cyclase and cGMP production [34, 35]. Control oocytes treated in the same conditions showed no induction of an ionic current. Higher concentrations of SNP (>10 mM) affected ionic permeability in some batches of control oocytes and were not used. Current voltage relationships were assessed in Na+ control saline and in TEA saline to assess potential blocking effects of TEA. All chemicals were purchased from standard sources except as specified above and were of the highest purity available. We thank Dr. John Regan for antibodies to AQP1, Amy Marble and Dr. Kathryn Bolles for technical assistance, Dr. Heddwen Brooks for helpful discussions, Neil Atodaria and Eileen Ryan for technical assistance with permeability assays using MDCK cells, and Dr. Ron Lynch for the gift of MDCK cells (University of Arizona). Funding was provided by NIH R01 GM59986 (AJY), American Health Assistance Foundation #G2001-026 (WDS), and NIH R01 DK16294 (WHD) and Research to Prevent Blindness Foundation.